The other day my kids were discussing what they would do if they had all the money in the world. Their dreams were amazingly realistic. My son decided he would build his own machine shop in our garage so he could slowly develop a small business. My daughter wants a dog. A black lab. This is no surprise. Dogs and her ongoing campaign for one are pretty much her only topic of conversation. The kids decided if their dad had all the coffee in the world and yearly trips to England he would be happy. I asked them what they would get me with all the money in the world. They both looked slightly bemused, as if there really could be no debate about this, and told me I could order all the books I wanted. My kids know me well. Apparently, I have been making a start on buying all the books I want even though we do not have all the money in the world. In my defense, I bought eleven books and I think I spent under $20.00 for all of them. Five of the books came from Brattle Book Shop in Boston. I wrote a post about it here. I stopped in again very briefly on my way home a few weeks ago and bought a few bargains from their outdoor section. None of them were books I was particularly looking for but they were all books I was pleased to find. The Victorian House sounds interesting. I like reading about how people lived in different time periods. I enjoy Edna St. Vincent Millay's poetry so it only made sense to snag a volume of her letters. I was pleased to find a copy of Mrs Miniver. It is a book I have read a few times but do not own. If you want you can read my review of it here. Woman Who Went To War fits perfectly into my interest in Britain during WWII. Finally, I found a copy of A Peculiar Treasure, an autobiography of Edna Ferber. I recently reread Saratoga Trunk so this seemed like perfect timing. I found a couple of books at a library book sale. Devil Water by Anya Seton was actually on the free rack. I read it years and years ago and remember very little about it. It might be time for a reread. 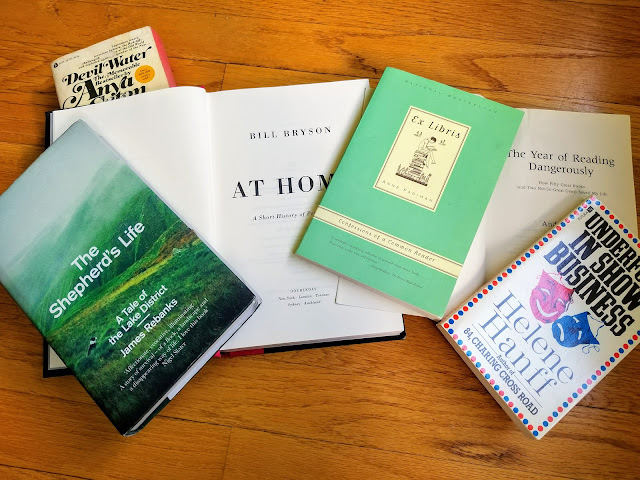 I bought a copy of At Home by Bill Bryson. I always enjoy his books. I had this as an e-book loan from the library but it is really more the type of book I like to dip in and out of rather than read straight through so when I saw a copy for a dollar I picked it up. The last few books are ones I ordered online. They are ones I particularly wanted, not ones I stumbled across like all the previous ones mentioned. I bought another Helene Hanff, Underfoot in Show Business, since I am in the process of rereading her books. Then I bought two books about books which might be one of my favorite reading categories. I finished The Year of Reading Dangerously by Andy Miller last week. It made me laugh and his enthusiasm shone through but I am still trying to decide whether or not to forgive him for not liking Pride and Prejudice. When I bought the Andy Miller book Ex Libris showed up as a recommended purchase. Who am I to argue about the wisdom of buying another book about books? It promptly went in my cart. I know nothing about it but it gets good reviews. My last purchase was The Shepherd's Life by James Rebanks. I follow him on Twitter and enjoy the bits of his life I see there so decided to give his book a try. I may not have all the money in the world but I do seem to have an endless supply of books. And if I did have all the money in the world what would I do? Well, I have always dreamed of a home library with shelves on all the walls, a big fireplace, and the world's most comfy chair. What do you dream of? 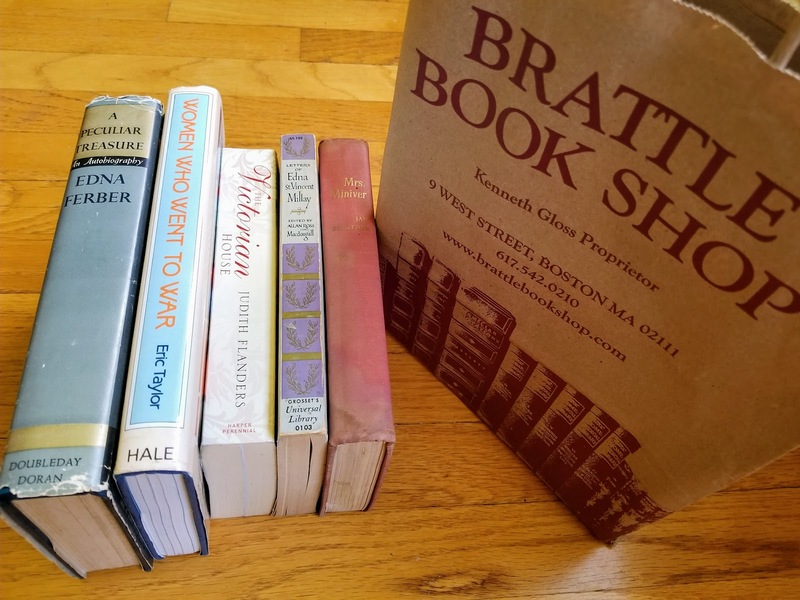 I really have to make it to Brattle Book Shop sometime. (Or do I? Do I really need more books? I'm not going to answer that question.) I'm glad you got Underfoot in Show Business, one of my favorite rereads of recent years, and The Shepherd's Life is wonderful. You always need more books. There is no questioning that. And definitely go to Brattle Book Shop. It is wonderful. Love reading your list of books. Is "The Year of Reading Dangerously" worth getting? Regarding what I dream of--a house on the Gulf Coast with a wide, screened-in front porch. Oh, yes! I would love a screened-in front porch. I enjoyed "The Year of Reading Dangerously." I didn't agree with all his book opinions but I did love his enthusiasm for reading and that alone makes it worth getting. The only one I have read is Mrs. Miniver and I thoroughly enjoyed it. I am very happy to have my own copy of Mrs. Miniver. It is something I know I will reread. It is good to know you recommend Ex Libris since I was completely unfamiliar with it. By the way, I am very much enjoying your podcast. I end up adding so many books to my list of potential purchases. And I have so many opinions about the things you discuss! If I had all the money in the world, I'd have a small house by the sea, somewhere I could walk to the beach. I would fill my house with books and cozy chairs! So we have similar dreams! A small house by the sea sounds wonderful. I go back and forth between a house by the sea and a house on a lake. I do love to be near the water. I adore Ex Libris. It hovers at the edges of my personal book canon and is a delight to read, I hope you will enjoy it as much as I do! I absolutely adored it. It is full of sticky notes to mark all my favorite passages.